From the air, Lake Como kind of looks like a jumping frog with one leg outstretching towards the city of Como and the other towards Lecco. It’s the deepest lake in Europe, over 400 meters deep, kind of like the Lake Tahoe of Italy. The bottom of the lake is more than 200 meters (over 650 ft) below sea level. The days are warm, the nights are cool and in the early morning there’s an eerie mist that consumes the lake, a perfect location for Mary Shelly to use as the setting for the marriage of Victor and Elizabeth Frankenstein. We’ve rented an apartment in the small town of Argegno. It could not be a better location. The lake is at its deepest here which is why it was the perfect spot for Pietro Vassena to make his world record bathysphere descent here in 1948. He went down 1352 feet. There is a statue of Vassena near the location where he made the dive. The apartment is big, the views of the lake are splendid, the small town (basically one main Piazza) is a 3 minute walk away. We have breakfast at the apartment, a small lunch somewhere along the lake and dinner every night is at “La Piazetta” in the Argengo main piazza. It’s a wonderful restaurant, highly recommended by us. Argegno is also on the ferry line, which means we can leave the car in the parking lot and take the ferries anywhere on the lake, and for the next three days, that’s what we did. Como is the birthplace of Pliny the Elder in 23AD. He died in 79 AD during the eruption of Vesuvius that buried Pompeii. As commander of the Naval fleet off the coast of Pompeii, he put himself in a small boat and sailed closer to the eruption in order to gather more information. All he gathered was poison gas, enough to kill him. Aside from his death near Pompeii, he was mostly known as the uncle of Pliny the Younger, also born in Como. The Younger wrote what is still considered the first complete encyclopedia “The Naturalis Historia”, one of the largest single works to survive the Roman Empire. It claimed to be the single source of the entire knowledge of the known world: history, zoology, botany, ethnography, astronomy, mathematics, geology, mineralogy, metallurgy, technology, food cultivation, cooking recipes, pharmacology, art history, sculpture, sociology, anthropology and archeology. It was reprinted well into the 17th century. Although it is still considered a great treasure, many of the claims have proven to be a little bizarre. For instance, the book claimed that a naked menstruating woman could scare away hailstorms and lightning, or if she walked into a cornfield all the insects would fall off the ears of corn. Amongst his anthropology claims was a tribe of small blue men who lived in India and hopped around on one foot. 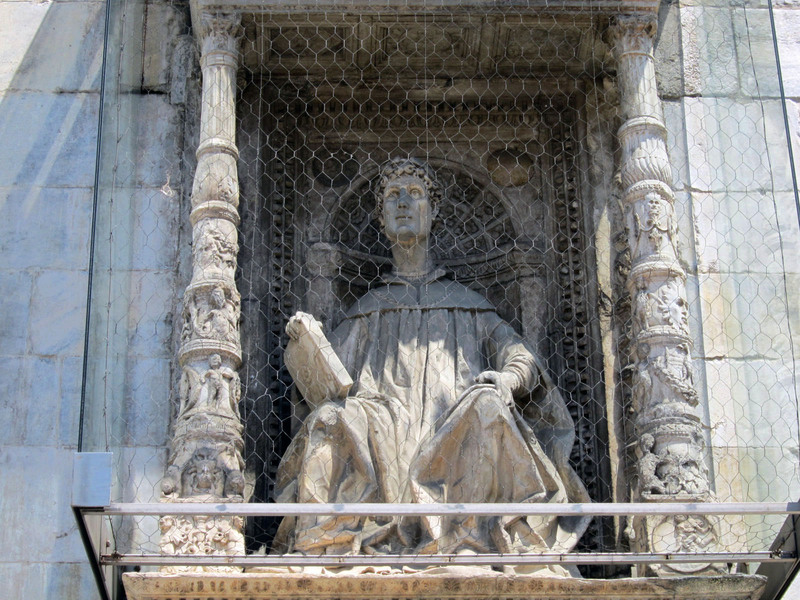 The front portal of the 14th century Cathedral of Santa Maria Maggiore in Como is flanked by statues of Pliny the Elder (on the left) and Pliny the Younger (on the right). Although it’s kind of strange to have these Romans deified on a Christian temple, the 14th century Catholics explained the honor by citing that during his life, Pliny the Younger had written a letter to Emperor Trajan praising the ethics of the early Christians and requested they be left in peace. And that’s all it took to get your statue on the portal of the main Cathedral. There is no explanation why Pliny the Elder is there, probably because he’s the uncle of the Younger and he was also born in Como. There is no history telling what he thought about the early Christians. Since the early 16th century, Como was Italy’s leading producer of silk. The silkworms aren’t here anymore, nor are the mulberry trees. The thread is now imported from China but still woven and dyed in the silk towns around Como. There are many shops around Como luring you in with special prices on silk clothing. It’s all pretty traditional stuff but they still seem to have a good market for it. We spent the day walking around the old walled in city and then out to the lakefront. 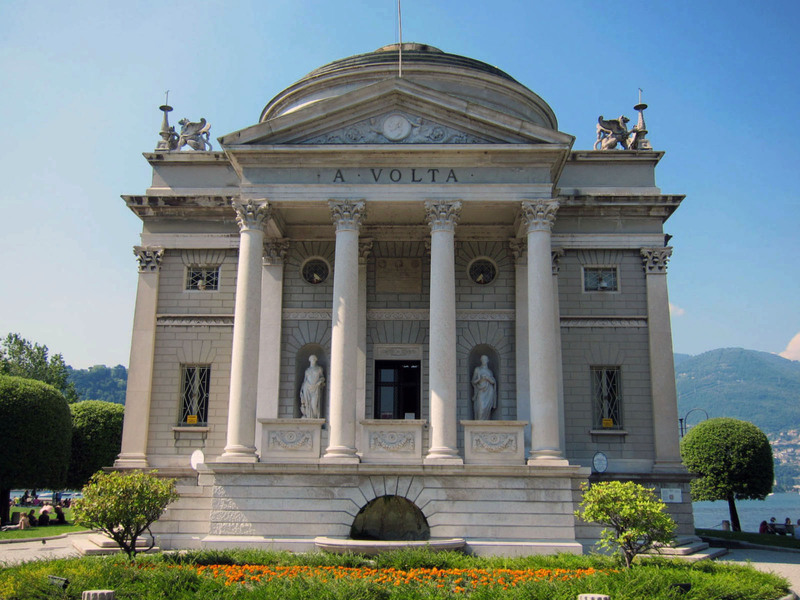 We visited the 1927 Templo Voltiano museum built in honor of Como native sun, Alessandro Volta, who built the first battery in 1800. The word volt, is descended from his name. 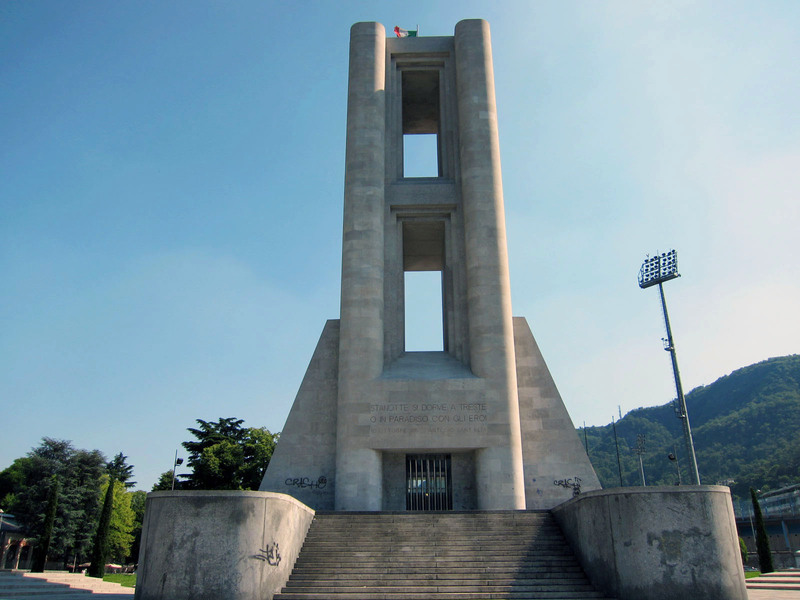 Nearby the Volta museum is the monument to the Italians who died in World War I, the Monumento ai Caduti . It was designed by the futurist architect Antonio Sant’Elia who never got to see it built. He died in one of the battles of Isonzo River between Slovenia and Italy. The worst Italian casualties of war occurred during the 12 battles along the Isonzo River and there are monuments all over northern Italy. Italy lost around 1.25 million people in the war and over 600,000 were lost in the 12 battles along the Isonzo River between 1915 and 1917. 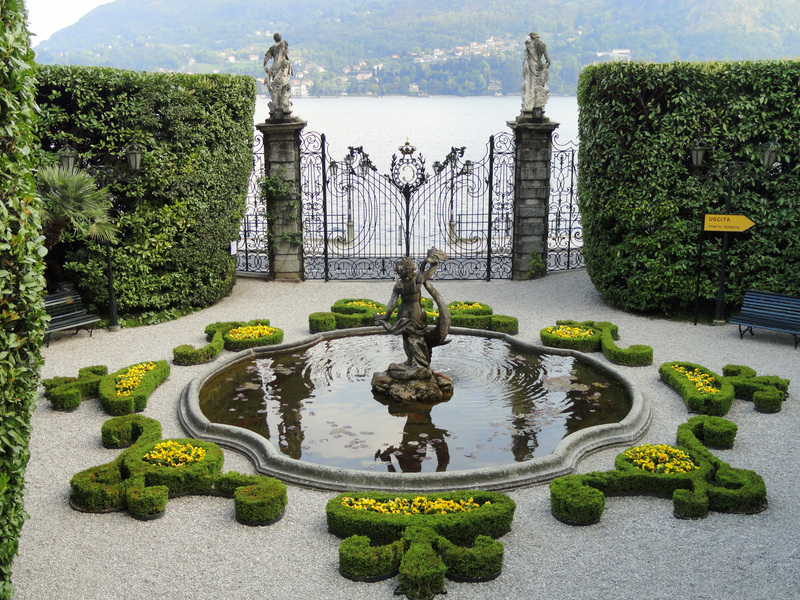 A short walk away from the War Monument is one of the grand villas of the Lake, the Villa dell’Olmo. Olmo is elm in Italian and according to legend, the enormous Elm tree in the gardens behind the house was planted by Pliny the Younger. The house was built in the late 1700s. Both Napoleon and Mussolini stayed here, at different times of course. It used these days for art installations and, of course, walks around the grounds and the famous Elm tree. From the lake you can see the old funicular climb up the mountains to Brunate, a 493 meter (1,617’) climb at a steep 55% angle. It’s been climbing up the hill since 1894. Also off in the distance we could see the last standing tower of the Castel Bardello built in 1158 by Emperor Frederick I Barbarossa. When the Archbishop of Milan, Ottone Visconti, was exiled in 1277 during the Guelph and Ghibelline wars, Castel Bardello became his outpost and stronghold. Visconti was a Ghibelline, a supporter of the Emperor. 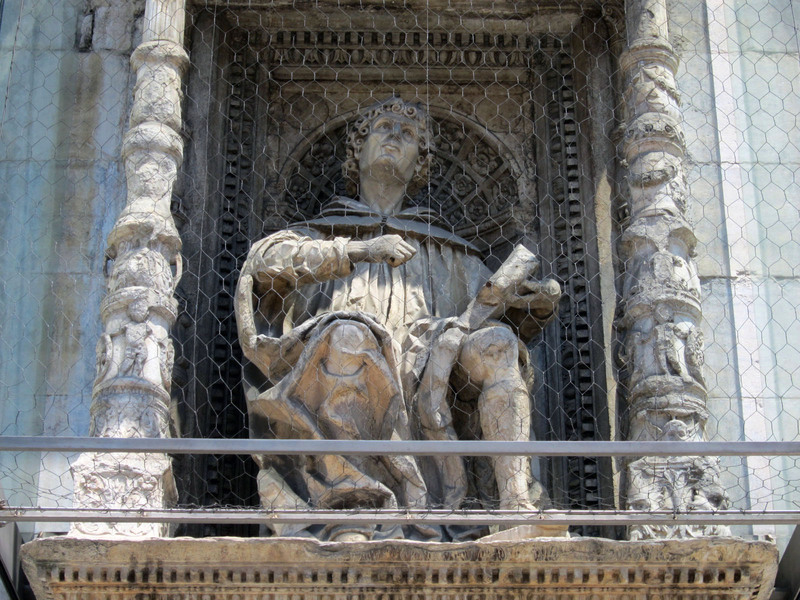 Napo della Torre of Milan, a Guelph supporter of the Pope decided that instead of banishing the Archbishop he should bring him back to Milan for trial and execution, one usually led to the other. So he set out for Castel Bardello to finish the job. However, Castel Bardello commands an amazing view and it was pretty easy to spot the troops of della Torre coming round the mountain. 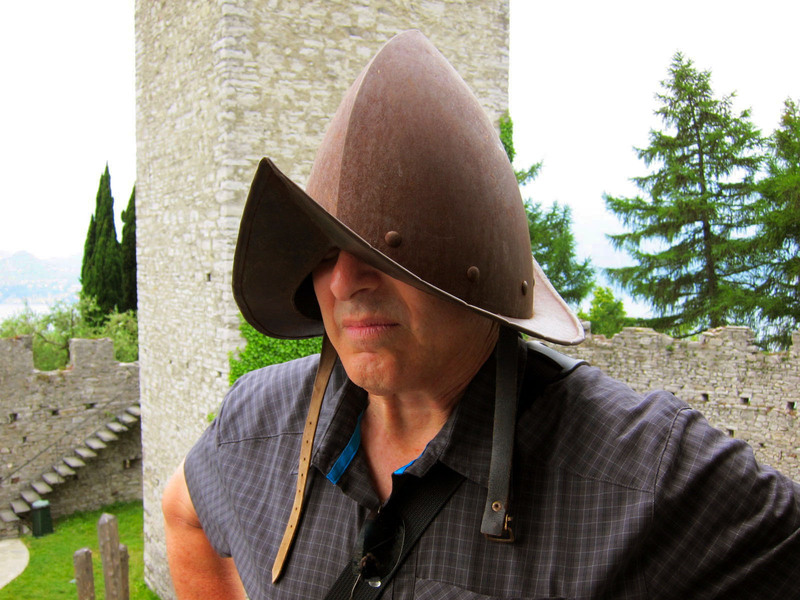 His troops were easily defeated and Napo della Torre (Napo of the Tower) ended up as a pun to his name. 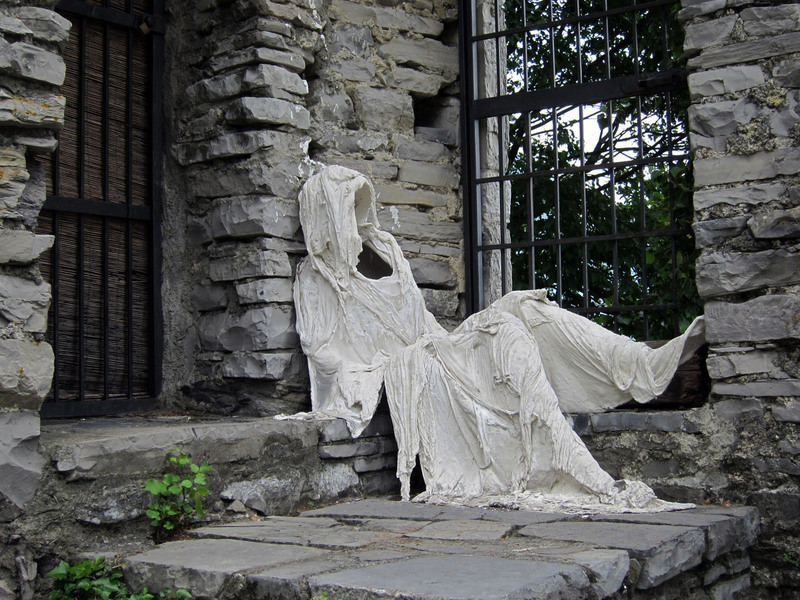 He spent the last 19 months of his life suspended in a cage from the Torre of Castel Bardello. 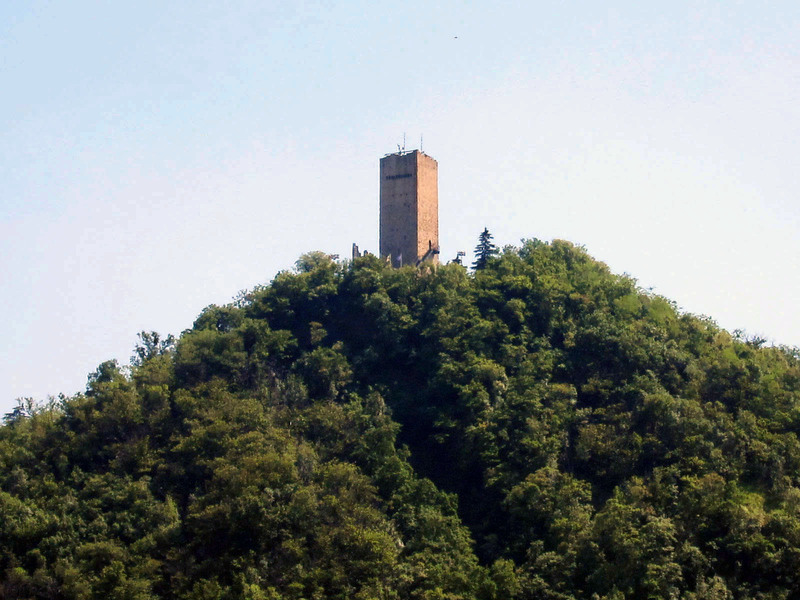 This 112 meter tall tower is the only part of the Castel remaining. By the way, in Brienno, a small town near our apartment in Argegno there is a small church said to have relics of the emperor Frederick I Barbarossa. Barbarossa died in 1190 when he drowned in 6 inches of water in the Saleph river in Turkey. He was too impatient to wait for his soldiers to clear the small bridge crossing the river so he took his horse through a place he thought shallow enough to cross. Unfortunately the current was too strong and the horse swerved and dumped him over. Unfortunately, the armor was too heavy and he landed on his belly. He couldn’t roll over. As the story goes, his troops put him into a barrel of vinegar to preserve him till they got him back to Königsberg ,Germany where another account of the final days states he is buried under the Königsberg Castel. 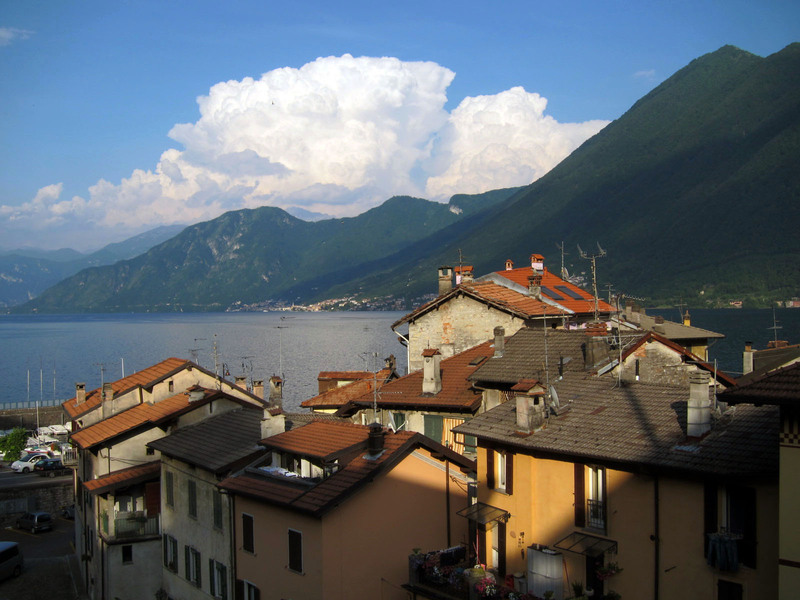 As I already mentioned, if you’re looking down on Lake Como, it looks like a jumping frog. Bellaggio is the crotch that separates the two legs. It’s a small city with a grid pattern of streets running vertically up and down the steep hills. 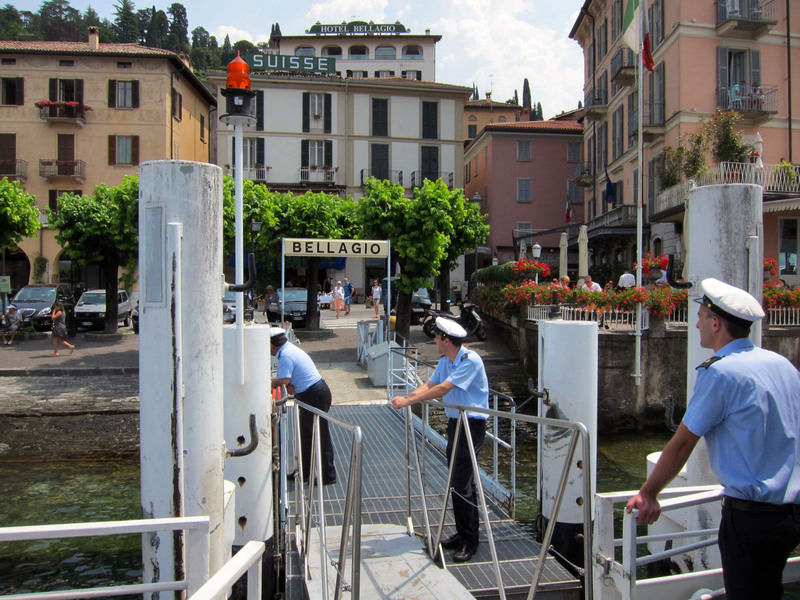 Because of Belaggio’s strategic position on the Lake it has been a favorite outpost since the ancient Romans. Now it’s on of the most famous international tourist destination on the Lake. The hotels are enormous, the villas are sumptuous and the shops are pricey. It’s referred to as the Pearl of the Lake, but that might be a name given by the hotels to encourage tourists. The Rockefellers also have a villa here that offers residency programs for writers, scientists, policy makers, artists and scholars. Not a bad place to work on a project. 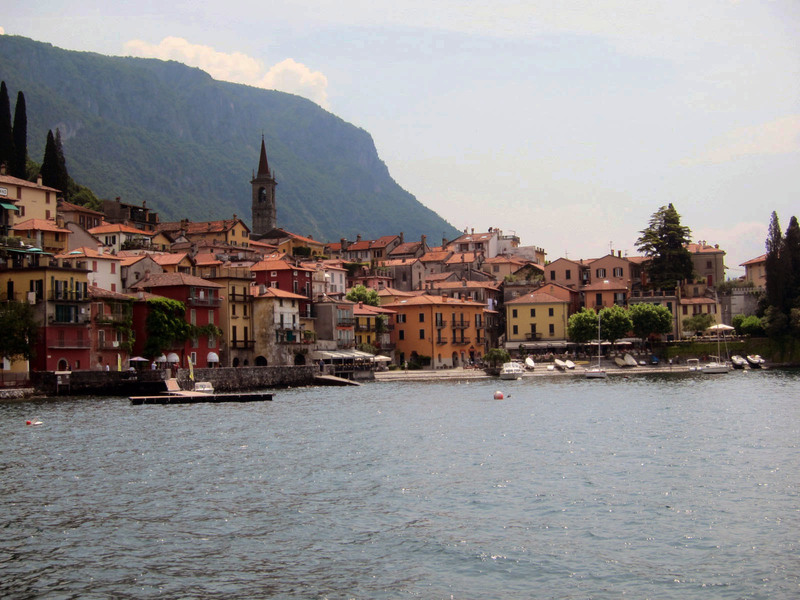 Varenna is on the eastern leg of the jumping frog. It’s one of the larger and most visited towns on the Lake but it’s more residential that Bellagio. There is a small lakefront walk and a few kilometers from the lakefront is Italy’s shortest river (820 ft), the Fiumelatte, named so because it dumps a foamy white cream into the lake as it gushes from it’s source somewhere inside of the mountains. 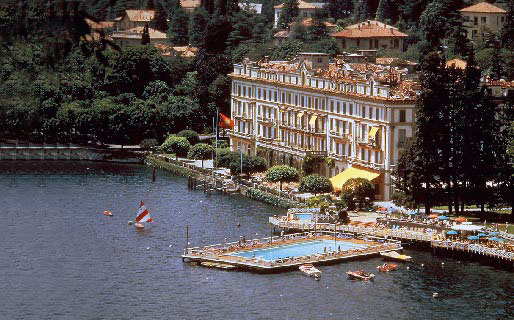 Varenna is also famous as the home of Giovanni Battista Pirelli who started the Pirelli Tire Company in Milan in 1872. We got off the ferry and had a short walk along the lakefront and then decided to climb up to the remains of the Castel Vezio. The earliest 7th century fortifications of the Castel were built by Lombard Queen Theodolina, but I think the remains of what’s up there is more towards the 12th century. We followed the road to the Villa Monestero built on the site of a 13th century convent shut down by the Archbishop of Milan, Charles Borromeo due to the scandalous behavior of the nuns. I wish I could find out more about this. Up the road from the villa, we saw a small arrow on a hand painted sign that pointed towards Castel Vezio. The path was about 14” wide and at a 60% climb up. There were lots of moments when we were climbing on all four limbs but the views going up were amazing. I have to admit, there were a few times when I thought we made a wrong turn but eventually we made it up to the castel, which these days is used as a Falconry refuge and school and an open air museum for large art projects by local artists. Inside the tower are some remains of old armor and chastity belts (they are weird) and an art installation of plaster molds of human figures. The plaster casts are made every Spring and stay up there until they are destroyed by the winter rain. We found another trail down the mountain that was a lot easier to navigate and soon we were back at the Ferry dock and minutes away from the ferry to Menaggio. 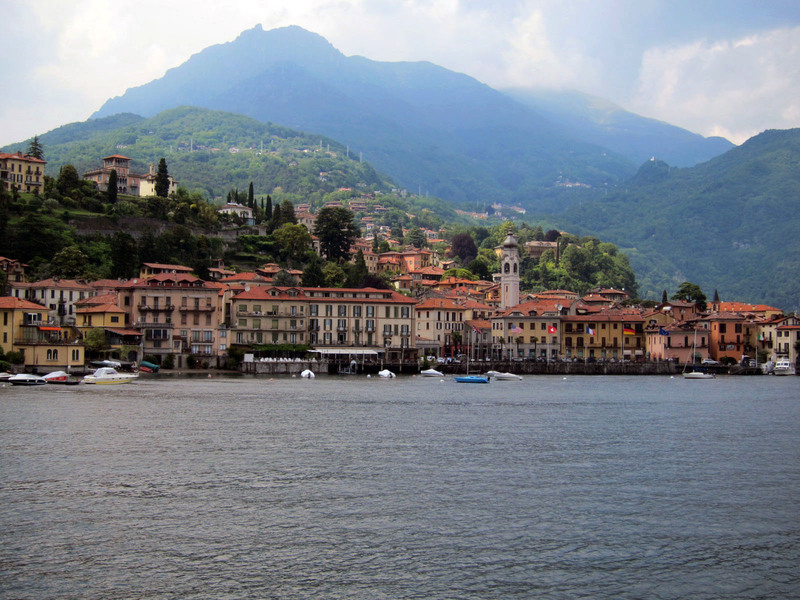 Menaggio has a longer lakefront and the town is more spread out along the lake, kind of like a small Como. Menaggio is famous for hiking trails and there are several that stretch out into the mountains. We got to the town late in the afternoon after we hiked up and down Varenna, so for us, it was just a short visit to the lakefront. Up in the hills are some World War I defensive trenches and the remains of the old 16th century Castel fortress that was once used by Gian Giacomo de Medici (Il Medeghino) the notorious pirate of Lake Como, who also had the dubious connection of being the brother of Giovanni Angelo Medici, Pope Pius IV. 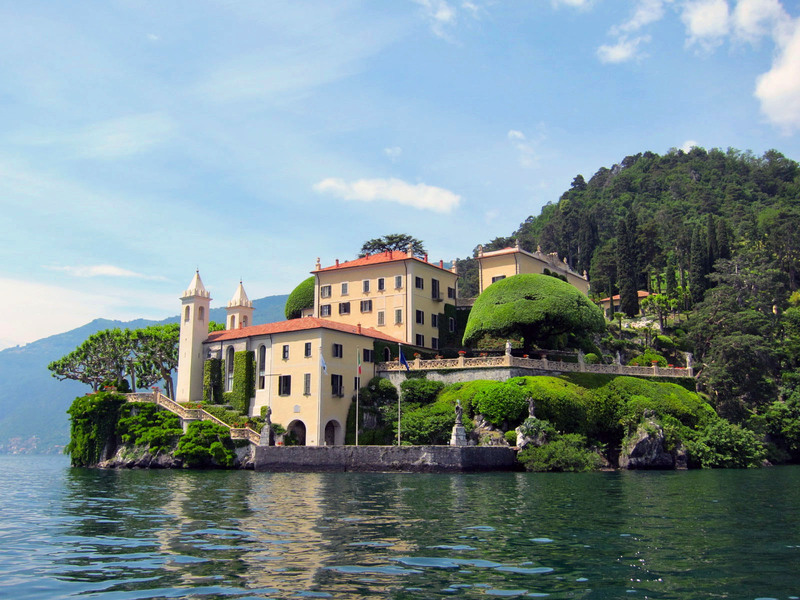 Villa del Balbianello was originally built in 1787. It was a Franciscan Monestery, although the chapel was turned into the kitchen when it was owned by Giuseppe Visconti in the late 1800’s. It ended up in the hands of Butler Ames in 1919, an American military General but was taken away from him by the Nazis during the days of the World War II. The Ames family did get it back after the War and in 1974, the Ames family sold it to the Italian explorer Guido Monzino, the leader of the 1st Italian expedition to climb Mt. Everest. Monzino was an avid art collector and his collection of pre-Columbian, Inuit, Chinese, ancient Greek, Cycladic and artifacts from other ancient civilizations is still in the same show cases inside the Villa. There is also his furniture, libraries and personal possessions in the same place they’ve been since he died in 1988. 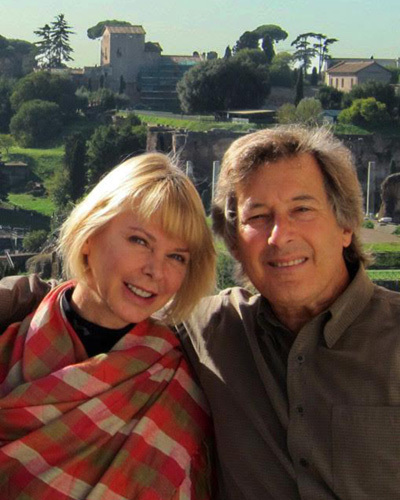 His will gave the entire estate to the Italian National Trust. On most days you can walk from the Ferry Dock to the Villa, about a 25 minute stroll along the lake. However, we arrived on the one day of the week the road entrance was closed and we had to take a water taxi. Lucky us. It turned out to be the most perfect way to arrive to the villa. You really get the lakeside proportions when you arrive by boat. The Villa was used as a hospital recovery location for James Bond in the 2006 film “Casino Royale”. It was also used in the 2002 Star Wars, Episode II film, “Attack of the Clones”. 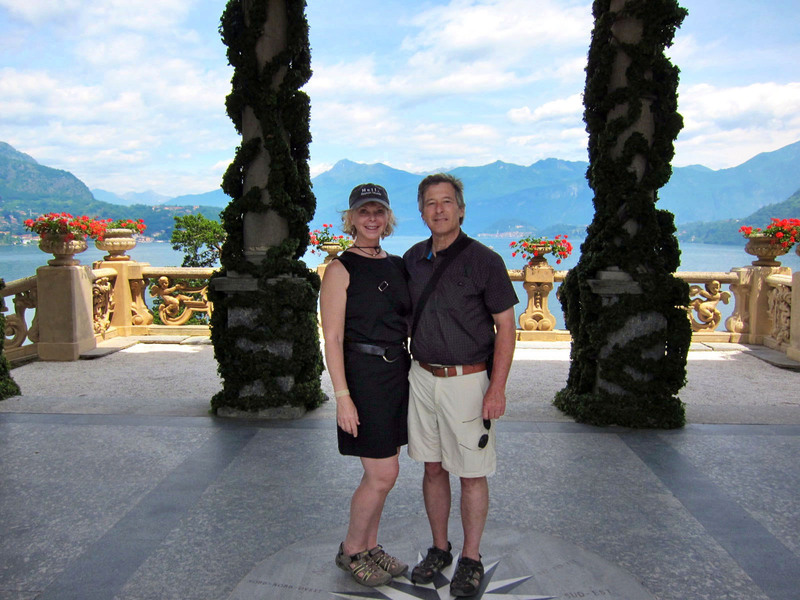 From Lenno we hopped on a ferry and set off for Tremezzo and a visit to Villa Carlotta. The villa was built in 1745, but it was later acquired in 1842 by Princess Marianne of Prussia as a wedding gift for her daughter Carlotta on her marriage to Prince George of Sax-Meiningen. The ground floors of the villa still contain some great paintings and Gobelin tapestries and some amazing statues by Canova and Acquisti. But the reason to visit this villa is the Italian garden, a perfect geometric landscape separating the grounds into various blooming garden wonderlands; the rhododendrons, azaleas, bamboo, cactus, rose, citrus, fern, tropical and others I just can’t seem to remember. Hillsides were terraced with cantilevered concrete planters, prehistoric looking waterfalls flowed across the fern gardens. There were steps up and steps down, man made grottos, small and large ponds, amazing views over the lake and everything, I mean everything, was pruned and hydrated to perfection. It was a real show garden. The photo above is from wikipedia. It was better than my photo. On our last day we mad a stop to Cernobbio. We stopped in a small café and had coffee and cornetti (Italian version of croissants) and then took a walk over to the “most famous” Villa d’Este, possibly one of the most expensive hotels in the world. Room rates are around €725/night (around $950) for a standard room with a courtyard view and an average of €1250 for a junior suite, €2000 for a 1bedroom suite. In the early 19th century it was the place where Queen Caroline of England hosted her “wild parties”, although we have no idea of how wild they really were. Caroline of Brunswick was the estranged wife of England’s King George IV. She and her lover Bartholomew Pergami used the house for lavish parties till the money ran out and she sold it a few years later. It became a hotel for the wealthy in 1873 and has stayed this way till now. Although we never saw any of the guestrooms, the lobby was a bit faded and not what I would have expected for such a famous hotel, but then we don’t rent hotel rooms for $950/night so what do I know? The photo above is from the Villa d’Este marketing.